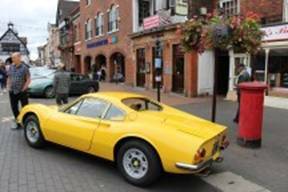 We had a most encouraging response to our first Bridgnorth event, both from vehicle owners and spectators alike. 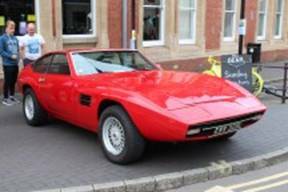 As did Andy May’s Intermeccanica Indra Fastback, although many struggled to correctly identify it. (The clue was written on the hub caps). 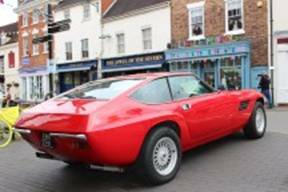 Jeremy Dutton standing beside his Bertone GTV with BBC Radio Shropshire reporter. 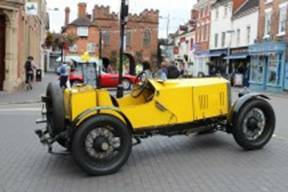 Owners and spectators alike thronged around the vehicles, enjoying the spectacle and Italianate ambience. 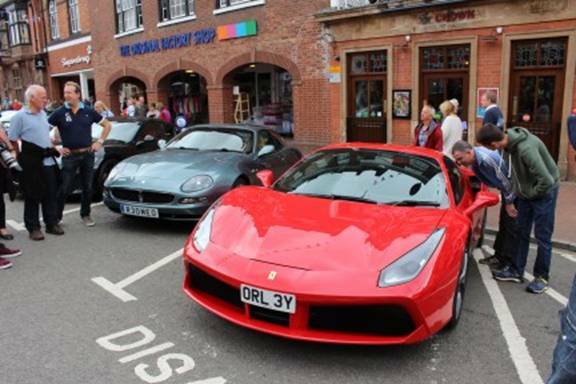 "The first ever Bridgnorth Italian Auto Moto Festival attracted Cars, Motorcycles, Scooters and enthusiasts from as far as Kent; North Wales; Majorca and Italy. 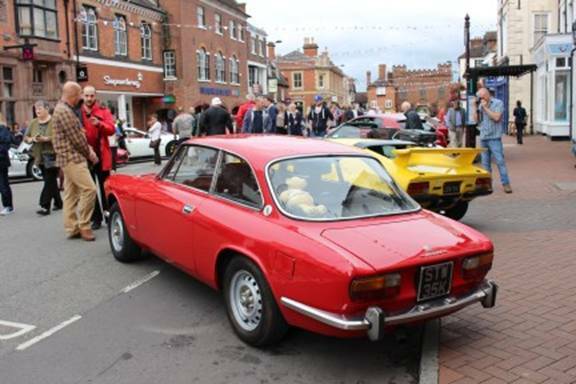 The ‘Italian Auto Moto Club’s original plan was to host a mini ‘Bristol type of event’ in either the midlands or the north. 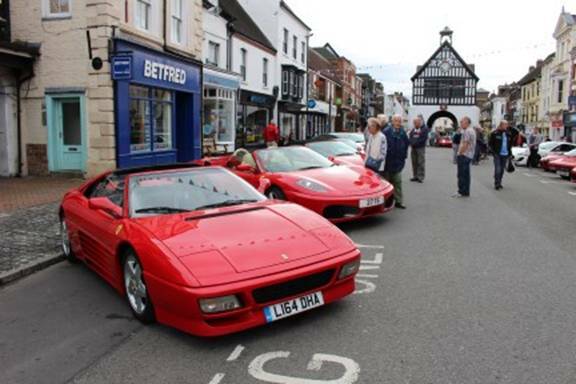 Having taken a look at numerous towns, Bridgnorth seemed to tick all of our boxes. A lovely town, with closure of the main street, not affecting crosstown vehicular traffic. After discussions with the Council’s officers, we were provided with one date: Sunday September 4th. 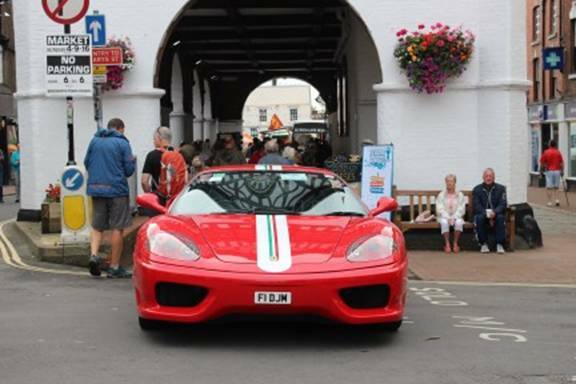 We accepted: a Continental Market at one end of the High Street, with the rest of the street being available for Italian machines - space for 47 cars; 50 motorcycles and about 40 scooters. 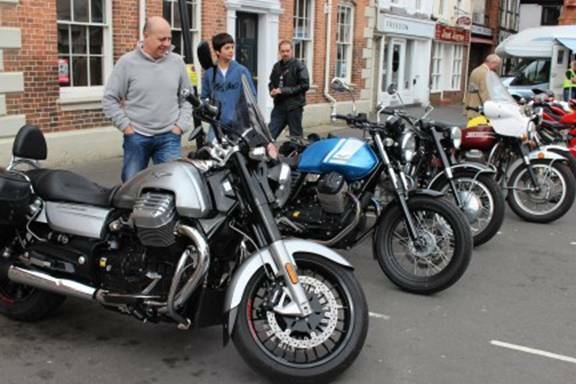 Things were looking good, but then, two significant clashes came to light: the southern Ducati weekend, and a massive scooter festival in Nantwich, just over the Cheshire border. Oops ! Interestingly, I received a nice E-Mail direct from the Ferrari factory, penned by Nick Kane, the designer of the La Ferrari hypercar. 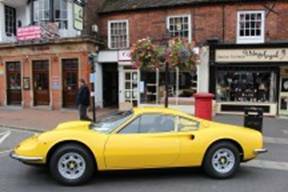 Nick asked if he could fly over from Maranello, pick up his Ferrari 328, and then come and display it. I spent a lot time thinking about this (about 37 milliseconds) and said........yes please ! 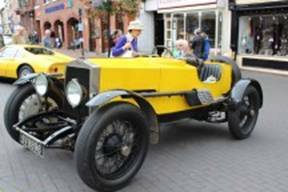 On the day, rare cars that arrived, included a 1923 Diatto and an Intermeccanica Indra. 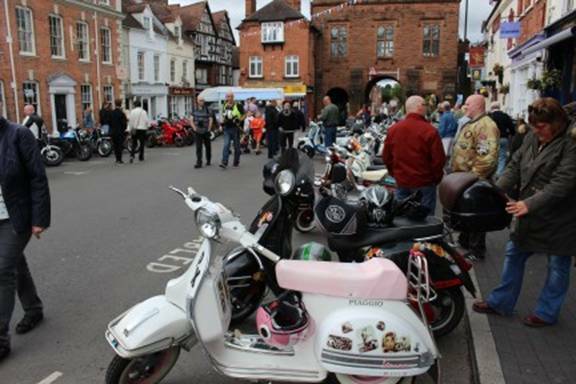 Moto Guzzis were well represented, and the Vespa and Lambretta showing was also good: considering the attractions of nearby Nantwich. 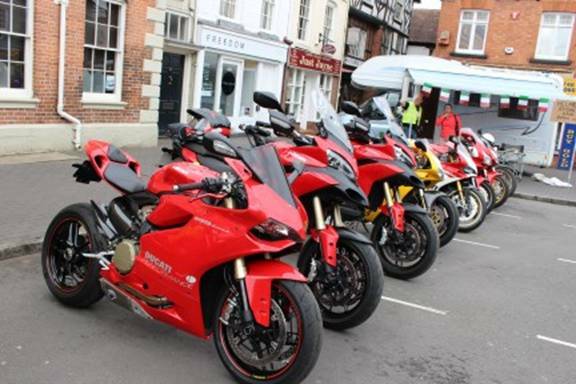 Ducatis arrived individually, but after an hour or so, a varied contingent of Bologna’s finest arrived in an impressive group , via the now famous Quatt Cafe: a few miles away. 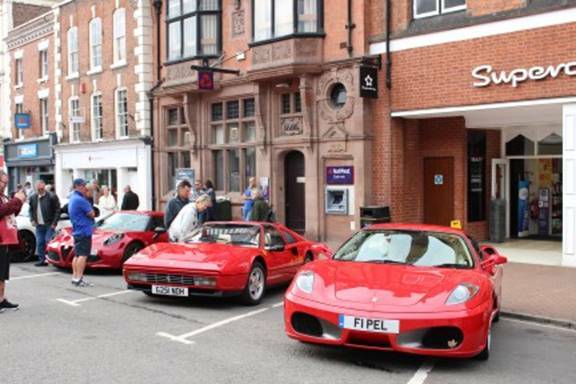 I was able to meet Richy Curzon, who brought a beautiful 916, and was strolling with family and friends. I was impressed to learn that he does his own belts and shims, and if he ever gets a quiet moment, I am hoping he’ll come and do my Bayliss Replica: next year.....? The Festival received fantastic press coverage - before, during, and after the event, and Radio Shropshire interviewed people continuously. The recordings featured on news bulletins, throughout the following day. Local newspapers also featured us on two whole full colour pages. A glossy local colour magazine is also running a spread at the end of the month. The Council has already asked us to re-run the event, and so, all that now remains to be done, is to take a real hard look at the 2017 DOCGB diary, avoid clashes, and get as many Ducatisti as possible there next year ! Forza Italia ! "